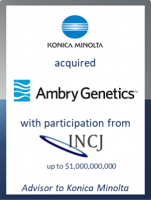 The transaction is the largest ever for Konica Minolta and marks a strategic shift for the Japanese firm's healthcare business as it seeks a leading position in precision medicine. Shoei Yamana, President and CEO of Konica Minolta, said: "The future of medicine is patient-focused. Together with Ambry, we will have the most comprehensive set of diagnostic technologies for mapping an individual’s genetic and biochemical makeup, as well as the capabilities to translate that knowledge into information the medical community can use to discover, prevent, and cost-effectively treat diseases. This will not only serve as the future foundation for our healthcare business, but will pave the way for a fundamental shift in the way medicine is practiced globally."